Should You Create a Multizone Home Theater? The word multizone may arise when you’re buying a receiver or amplifier for the home theater. A multizone system extends the usefulness of home theater by enabling you to access different audio sources and send them to independent outputs simultaneously. For example, the kids can watch Sesame Street in the family room while you listen to Dunne Roman in the kitchen. 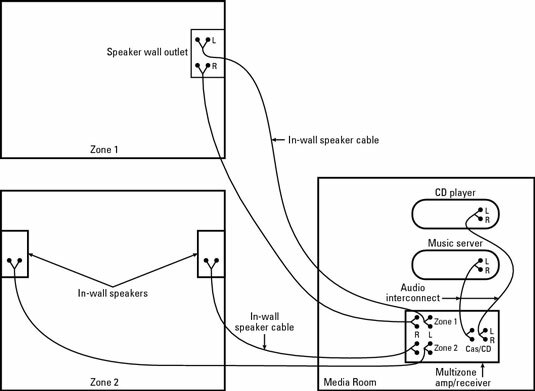 A common setup for a simple, multizone audio network. Planning for whole-home audio is a good reason why you are going to need to think outside just your home theater. When most people think about a home theater, they think within a pretty confined box — the place where the home theater is going to be. However, you should consider spending a little extra money and be a little smarter in your planning so that you can access the home theater elsewhere around the house and from the Internet, as well. Although you can grow your whole-home network over time, you’ll save money in the long run if you have a well-thought-out plan at the beginning. After you’ve already built the network, adding things can be more expensive. There’s a world of difference between running an extra set of speakers to the bedroom or dining room for your audio and wanting to have background music in every room. If your multizone audio plans are limited, you can almost always get inexpensive (under $100) devices from Radio Shack or SmartHome that can meet these needs.